•8 gang outlets are good for home and office using to connect multiple appliance or devices. devices and supply exact current, smart and fast charging. •750J surge protector was built in this vertical power strip. •Overload protection was built-in. Shut down automatically while overloaded. •Safety Doors were added for each outlet & USB port, protect them from dust and wear. •3 meters 18 AWG extension cord. •Warm LED light, no dazzling. •FCC certified. Compliant with US safety standard. 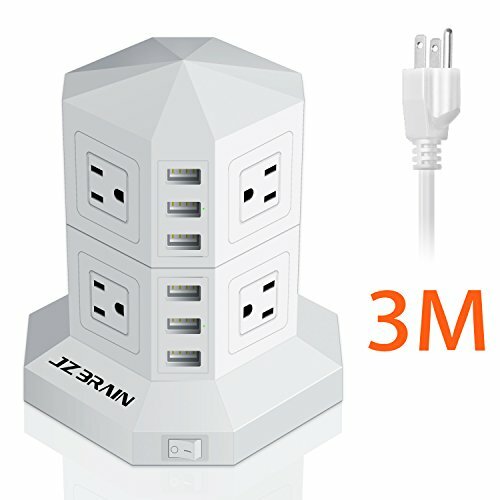 you can charge 5 ports at the same time. otherwise the charging efficiency would be much lower. don't worry the 2.4A maximum output will damage 1A rated current devices, it is smart charging.